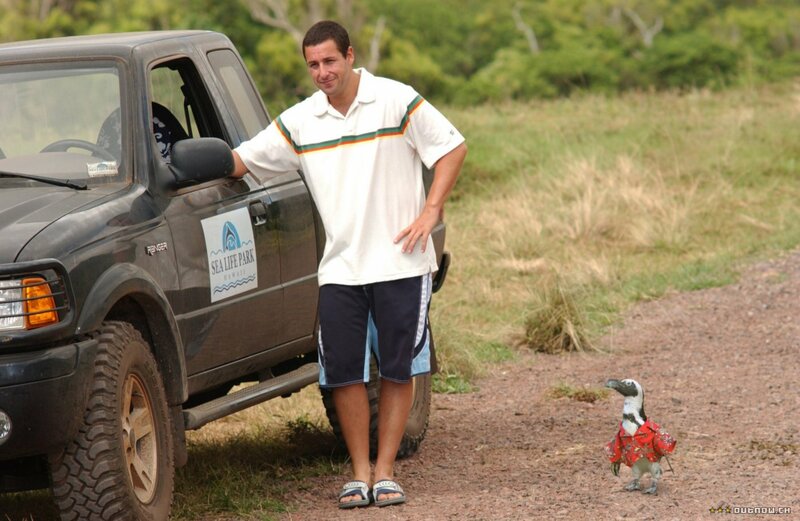 A romantic comedy with a clumsy premise, 50 First Dates reunites Adam Sandler with Drew Barrymore, but is weighed down with thin material and too many juvenile elements. In Hawaii, marine veterinarian Henry Roth (Sandler) is a renowned womanizer, carrying on quick affairs with ladies on vacation mode and dumping them with regularity. After a sailing mishap he washes up at a secluded beachfront diner and meets the attractive Lucy Whitmore (Barrymore). They chat and make a connection. Following up the next day, Henry is shocked that Lucy does not remember him. He learns that a year ago she was in a car accident, suffered a brain injury and is now unable to retain short-term memories. Every day for Lucy is a blissfully unaware clean-slate repeat of the day before her accident, orchestrated by her family and friends. Henry meets Lucy's fisherman father Marlin (Blake Clark) and dimwit brother Doug (Sean Astin). They eventually start to trust Henry as someone who cares for Lucy, and he convinces them to try a new approach, allowing Lucy to watch a video every morning explaining her circumstance and then letting her live through a new but real present day. And every day Henry waits for Lucy to get over the shock and sadness and then proceeds to win her affection. But finding long-term happiness with someone who cannot build new memories will not be easy. Sandler and Barrymore clicked in 1998's The Wedding Singer, and they do share a sweet chemistry and easy affinity. Her natural perkiness and his inexpressive confidence mix well at a comfortable rather than spark-inducing wattage, quite suitable for a romance that is more about building a relationship than the mindless pursuit of lust. But unfortunately Sandler cannot help but populate too much of the film with low-brow humour to appeal to his core fan base. The numerous scenes with Rob Schneider as Henry's idiot friend, Sean Astin as Lucy's lisping and steroid-inhaling brother, and Lusia Strus as Henry's sexually ambiguous work colleague are as infantile as comedy gets, and appeal only to Sandler fans with a mental age of five and under. A large walrus and a small penguin also get plenty of screen time. Although the best laugh does involve Barrymore, Schneider and a baseball bat, tellingly Barrymore barely appears in any of the scenes with the inelegant co-stars, as if Sandler was engineering two separate films at once, one full of shallow antics for the morons in the crowd, and another a romance for the couples. The many puerile moments both undermine the cuter romantic elements and reveal the shallowness of the available ideas. Stripped of the padding, 50 First Dates would barely find an hour's worth of material. The parts of the film that do focus on the two central characters are merely adequate. Director Peter Segal nudges the back half of the story towards some modestly thoughtful scenes exploring how Lucy could be prodded to live in the present despite her condition. Barrymore is fine as the woman who has to re-learn about her life every morning, but Sandler brings little to the film apart from his stock lethargic persona. Neither character is provided with any sort of depth or backstory. Dan Aykroyd has a small role as Lucy's doctor, and Maya Rudolph appears in one scene. 50 First Dates holds some promise for a pleasant evening but turns out to be gawky, pimply and rather crude.